This is such a versatile recipe. Eaten hot or cold with vegetables or just sliced on its own – it’s delicious. What’s even better is that it comes with a couple of short cuts. 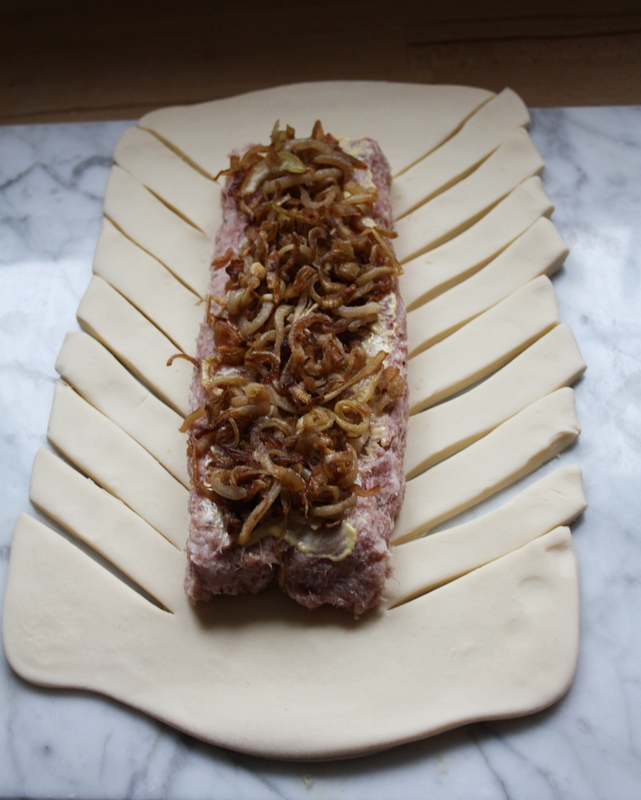 The puff pastry can be home made or bought, and the sausage meat can be made either entirely from scratch or from the contents of six sausages. The caramelized onions can be missed out, as can the mustard or even both. I don’t know why I have come to making sausage plait so late in life. Maybe it is because my mother refused to buy sausages as she didn’t care for what they were made of. Perhaps that’s why I have a huge weak spot for anything containing sausage meat. So what else could satisfy the brief of forbidden food from an extremely large sausage roll in the form of a large piece of sausage meat encased in golden layers of puff pasty. I might have come late to actually baking my very own sausage plait but I was no stranger to eating them or a smaller version in the shape of the sausage roll. Every Saturday my mother would park in the Catholic church car park – why we were blessed with one of their precious parking spaces I will never know, but we were and this is where my mother and I parted company. She would go to the fish mongers and her favourite market stall where only they had the best and freshest vegetables and I would go to collect the baked goods. Not from any old bakery, no, ours were from La Boulangerie! It was the bakery. Situated at the top of a steep cobbled street. It comprised of a small tight little shop with low dark beams. There was hardly room for the army of assistants behind the counter who spent their day going back and forth to the bake house in the back, let alone the hordes of customers that flocked to buy their bread and baked fancies. I would stand at the end of a long queue that would wind itself not just around the shop but out of the door and down the high street. The moment I arrived in the queue I would start to feel anxious about whether there would be enough baked goods to go around. I knew my mother’s order was safe but it was the extra item which I desired that had me in a froth. As soon as I had made it into the dim interior of the shop my eyes fixed upon the ever depleting pile of my heart’s desire. As I edged forward the stock became dangerously low, another batch would be brought in from the back but every now and then my ears would prick up to ‘sorry, we have sold out’. Finally, it would be my turn. I would request my mother’s order with a faint squeak of a voice and then add ‘and one sausage roll please’ – ‘large or small’ would chime back. In those days large was out of my price range so small it was. As I squeezed my way out of the shop and into the fresh air I would head straight round the corner to a wooden bench where I would enjoy the pleasures of my toil. I developed a way of eating the sausage roll discreetly in the bag, as eating in the street was frowned upon. This technique would allow golden flakes to drop to the bottom and when I had devoured the roll I could then have the pleasure of shaking all the flakes to one corner of the bag and then tipping the whole lot into my open mouth. Once that was done I headed back to the car to meet up with my unsuspecting mother. N.B. The sausage meat when in the oven does tend to release fat so it is best to use a baking tray with a shallow lip. Peel and cut onions in half and then slice thinly into half rings. Heat the oil and butter in a pan and add onion slices. Allow to cook slowly for twenty minutes. Stir from time to time making sure the onions do not stick. If they do start to stick add a tablespoon of water. When the onions have turned a lovely golden colour, add a few drops of balsamic vinegar and 1 tsp of sugar – continue to cook on a low heat for a further 5-10 minutes. Allow to cool completely. If using sausages – split them open with a sharp knife. Remove from the skins. Knead a couple of times to combine and then on a lightly floured board gently roll into a large sausage. Roll out the pastry into an oblong. Place the sausage meat in the centre. Spread a layer of mustard along the top. Then a layer of the caramelized onions. DO NOT BE TEMPTED TO PLACE WARM caramelized onions on, as this will melt the pastry and make it impossible to work with. 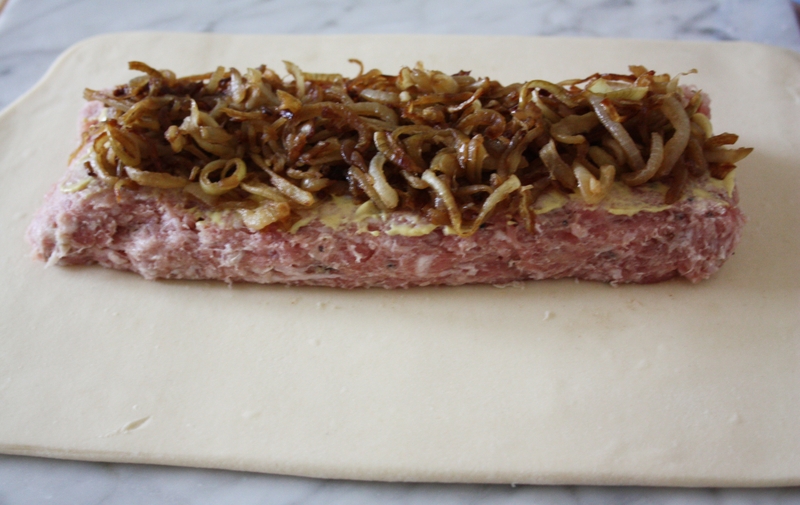 Make cuts into the pastry on both sides of the meat and no further. Taking one strip fold over the filling then from the other side take a strip and fold over. Carry on down the pastry, this will form the plait. Tuck the ends under the strips at the top and bottom. Trim any extra pastry. Transfer to a baking tray and place in the fridge for 30 minutes. 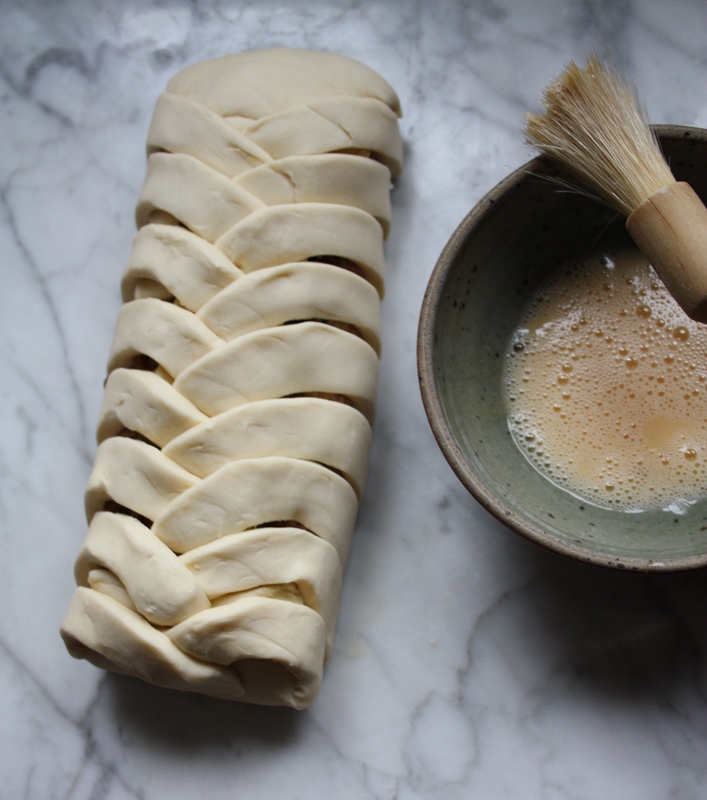 Brush the pastry plait with the beaten egg. Place in the oven and cook for 35-40 minutes or until golden brown. Remove from oven and allow to stand for 10 minutes. Serve. Delicious hot or cold.